WE PRESENT CONCERTS THROUGHOUT THE YEAR! By attending one of our concerts you will not only enjoy the best of Brazilian Music but you will also be helping many organizations to remove children off the streets, helping them being socially responsible, and giving them the opportunity for a better life through music. 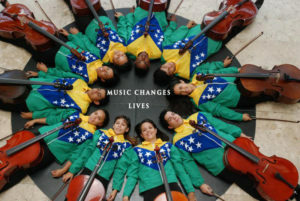 BMF supports music educational projects in New York and the surrounding area, as well as projects being developed in Brazil and in other countries such as “Orquestrando a Vida”.